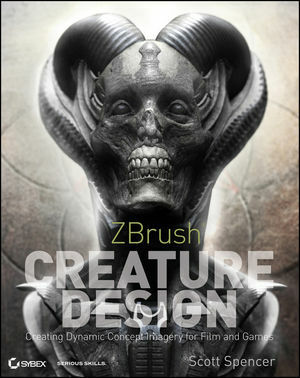 Zero in on the most cutting-edge trend in creature design for film and games: ZBrush! ZBrush Creature Design helps you bring your creature concepts to life. Scott Spencer has worked as a character designer and sculptor at The Weta Workshop in Wellington, New Zealand, since 2009, most recently on The Hobbit. He has taught ZBrush digital sculpting at Gnomon since 2005 and was previously an artist at Gentle Giant Studios. His credits include films such as Alice in Wonderland, the game Golden Axe for Sega, and dozens of other projects. He is the author of ZBrush Character Creation and ZBrush Digital Sculpting Human Anatomy.